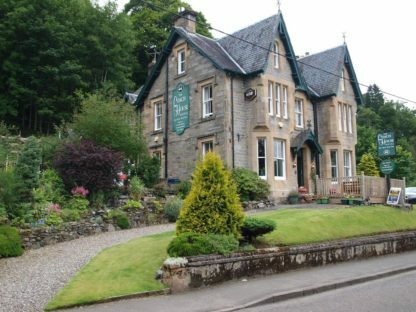 With stunning views across the River Lochay towards Loch Tay, The Coach House Hotel is situated in Killin. Close to the beautiful Falls of Dochart The Coach offers comfortable rooms and home-cooked food. Most rooms have en suite baths or showers and all have TVs, DVD players and tea/coffee making facilities. There is Wi-Fi internet access throughout the hotel and free parking. Breakfast is included in the room rate and is served in the dining room, with its ornate ceiling and views across the river and mountains. The lounge bar has a log-burning stove, and serves hearty home-cooked food. There is a fine selection of real ales as well as a pool table. Local artists provide weekly live music. Within a few minutes walk of the hotel, you can choose from loch-side rambles to challenging walks like Ben Lawers, Rob Roy Way or one of the many Munros (Scottish Mountains) in the area. Killin Golf Course is just a few minutes walk from the hotel and offers a challenging par 66 course. Finlarig Castle, built in 1609 and former seat of the Campbells, is just 10 minutes away.